Below are our Day 1 practice notes from North practice. Today's "winners" at practice were NC State QB Ryan Finley, Michigan RB Karan Higdon, Ohio State WR Terry McLaurin, Washington OT Kaleb McGary, Arizona State DT Renell Wren, and Penn State CB Amani Oruwariye. -In an overall rough day for North quarterbacks, NC State's Ryan Finley was the standout of the practice. Accurate, decisive, and with great control/pace in individual drills, Finley looked the part of a capable NFL starter. He struggled in team situations and was a bit flummoxed under pressure, but he was the only North quarterback who displayed consistent accuracy on Day 1. -Duke's Daniel Jones has the smoothest release and certainly passes the eye test of an NFL quarterback, but just wasn't finishing throws with velocity and timing as well as desired. He's still strongly liked by NFL teams, especially those that don't have an immediate need at the position day one, but he has plenty to improve upon this week. -Early in the week is always hard to evaluate running backs, but Karan Higdon of Michigan has the smooth running style and cuts to look the part of a Kareem Hunt-like versatile runner. He looked natural as a pass catcher, something Michigan didn't ask him to do a lot, and he's on track to be a big winner this week if he can continue to show versatility. -The North receivers are built around pure speed. 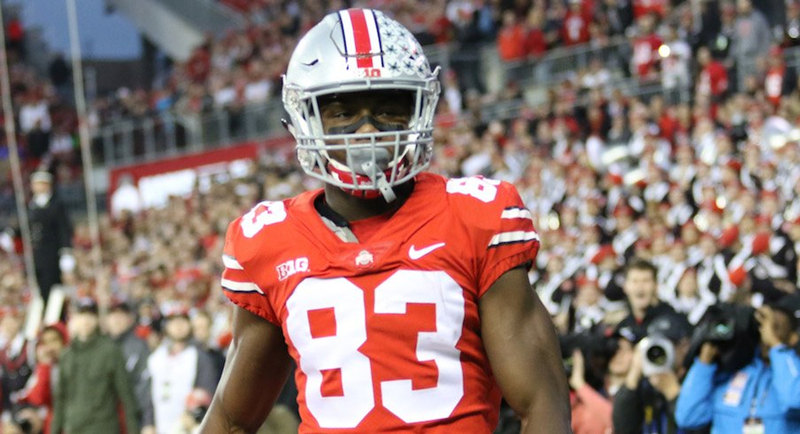 While Ohio State's Terry McLaurin won the "winner" award, it was really splitting hairs between McLaurin, Massachusetts WR Andy Isabella and Northern Colorado WR Alex Wesley. McLaurin won in a variety of route and gained a huge amount of separation on a fade after beating Washburn's Corey Ballentine with a sudden outside release. McLaurin later beat South Dakota State CB Jordan Brown on a deep curl route in 7v7s and again on a drag. -Mentioned above, Andy Isabella may have lost the weigh in coming in under 5'9", but he was a bolt of lightning in 5v5s and 7v7s. Isabella's feet are so fast and he keeps his upper body so controlled, looking like a duck churning his legs rapidly under water. Isabella wastes no time turning up field to accelerate for yards after catch and he shook Utah safety Marquise Blair out of his shoes on one route from the slot. -Jim Nagy raved about Alex Wesley's speed in his intro presser yesterday, and deservedly so. Wesley demonstrated outstanding foot speed and was very difficult to keep in-phase beyond the second level, no matter who covered him. Wesley was able to win match ups deep with posts and on quick slants but had a drop on an intermediate out route with Delaware DB Nasir Adderley trailing. -With only two centers working in with the North team, Texas A&M’s Erik McCoy became a marked man very quickly in Practice 1. In four reps in one-on-ones, McCoy did poorly on three of them, all at the hands of Arizona State defensive tackle Renell Wren. At the moment, it is fair to say that he’s gotten off the worst foot of any lineman on either team so far. -While the North’s offensive linemen were more average than polarizing, the opposite was true for the South today. Along with McCoy, Wisconsin guard Beau Benzchawel disappointed today. At right guard, he was beaten inside by Boston College’s Zach Allen, was left on the ground by Western Illinois’ Khalen Saunders and was beaten by Iowa’s Anthony Nelson. -On the bright side, Washington right tackle Kaleb McGary had the best day of any offensive lineman at the Senior Bowl. He won all five reps in pass protection, which is very impressive considering the drill is built for offensive success. He also left his opponents (Allen and Northern Illinois’ Sutton Smith) on the ground in three straight reps to end the one-on-one drills. -As with Daylon Mack in the South, the star of the defensive linemen in Practice 1 today for the North was a defensive tackle. Renell Wren of Arizona State saw plenty of nose tackle reps and made the most of them. While his great first step never really matched up with his college production, it is showing up over and over again at the Senior Bowl. It’s worth noting that he is the only player in these practices who is choosing to play nose tackle in every one-on-one rep.
-John Cominsky of Charleston is a 6’5” 286 defensive end who had the potential to play inside or outside of an offensive tackle, but if today is any indication then he’s going to be an edge rusher moving forward. In his single rep as a defensive tackle in pass-rushing drills, Charlotte’s Nate Davis mirrored him for a good five seconds, with Cominsky getting no progress done in a phone booth before the whistle blew. -Kaleb McGary was one of the better offensive tackles today, but it is worth noting that Sutton Smith, Northern Illinois’ 234-pound pass-rusher, was taken to the ground in too many of his few reps on the edge in Tuesday’s practice. The worry about Smith is that the All-American’s frame is too small to hold up against NFL offensive linemen and today did nothing to convince doubtful teams otherwise. Today isn’t the end all be all, but Smith needs to make the most of his reps for the rest of the week if he wants to stick on as an edge defender rather than an off-ball linebacker. -The defensive backs had a much tougher go of it than the receivers, but Penn State CB Amani Oruwariye had a great showing. Despite boasting great length (6016, 204, 32" arms), Oruwariye had the backpedal of a much smaller cornerback with great ability to plant and drive downfield. Oruwariye also showed great understanding of holding the red line and using the sideline as an extra defender to suffocate receivers out of bounds. -Washburn CB Corey Ballentine got beat on a few deep plays today and recovery speed is certainly a question mark. With that said, the small school product did not shy away from the competition and did not hang his head. After allowing outside release on McLaurin for a deep touchdown, Ballentine lined back up on the next rep and bullied McLaurin to force him inside. -South Dakota State CB Jordan Brown had a forgetful performance, routinely showing up on the negative end of completions and failing to make a standout pass break up. Brown will need to amp up his production and make some plays to get back on the radar for the remainder of the week.